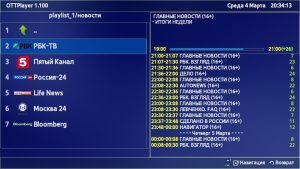 Auto EPG supported only for russian channels. 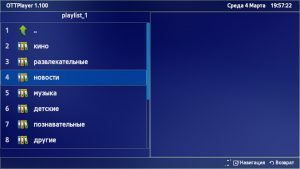 Be sure before uploading your playlist with M3U / M3U8, XML, XSPF file formatted. If you have any problem you can leave a comment. We’ll be glad to assist you. To use this service you need to install the application (player) to your device and to authorize (enter your login and password ). After the login the device automatically connects to your account and available to bind to it your playlists. 1- Download and extract LG_WEBOS_OTTPLAYER.ZIP to the root of the USB flash drive. 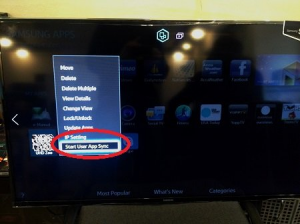 2- On the TV, we enter under the account in SmartTV LG. 3- Insert the USB flash drive into the USB connector of the TV. 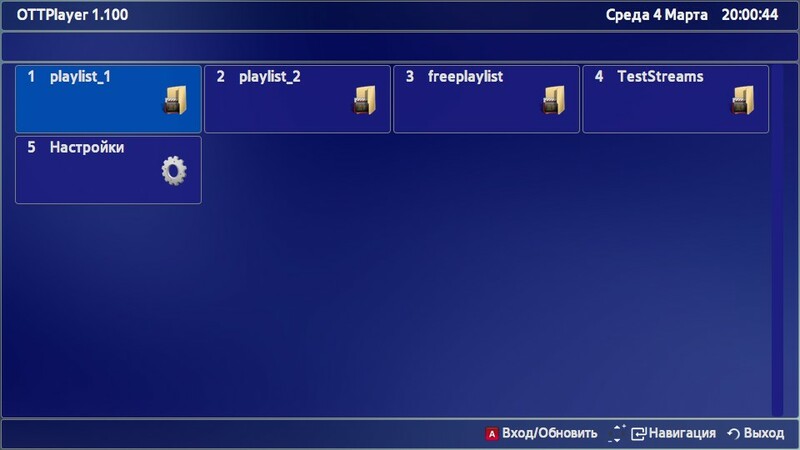 4- When the message about connecting a new USB device appears, click on the Home on the remote and use the buttons to find the widget in the Launcher list. 1- When you first start OttPlayer warns in the form of a pop-up message about the need to enter registration data. 2- After launching the widget, go to settings. You must fill in your username and password. Registration data are identical to the data you use, to enter the ottplayer.es site. Here you can also configure additional options. Changing each option is completed by clicking OK on the remote. 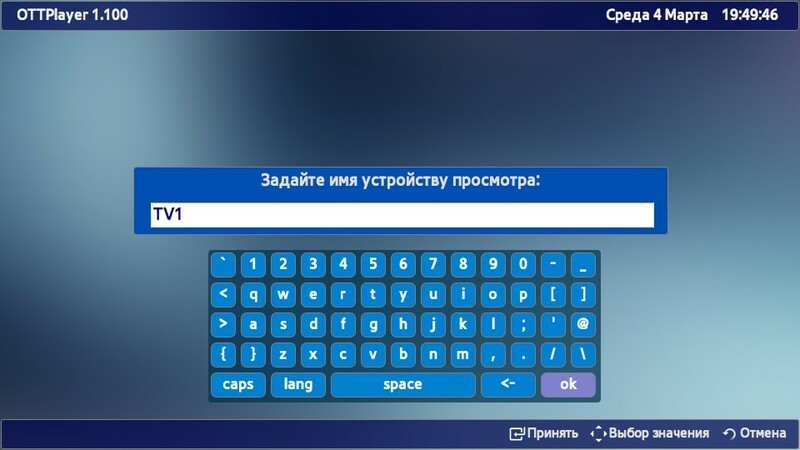 To save the fields, such as login and password, select the OK button on the on-screen keyboard with the arrows and press OK on the remote. 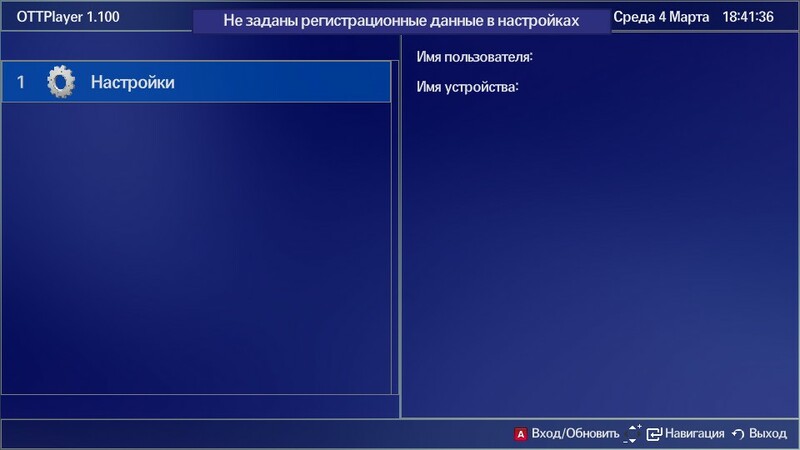 If after changing any item, press Back on the remote control, the changes for the selected item will not be saved. After changing all the necessary settings, press the red button on the remote control to save the changes. If you click Back – all changes will be lost. 3- After the first authorization, you will be asked to register a new device, or select one of the previously registered devices. The device will be available in the list of your devices on the site. Once on the site ottplayer.es will bind playlist to a new device, you can restart without the widget, update the data by pressing the red button on the remote. 4- Next – navigate through the menu to the selected channel and enjoy watching. 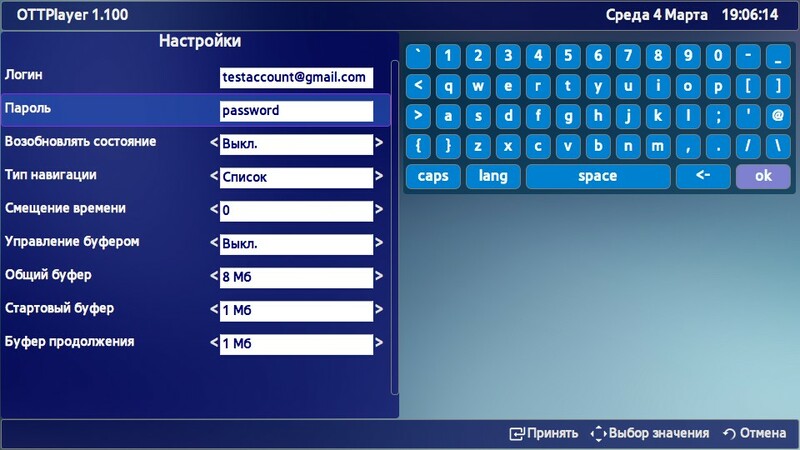 5- This is an alternative interface that you can choose in the options. 1- Unpack LG_NETCAST_OTTPLAYER.ZIP into the root of the USB flash drive. 2- Connect the USB flash drive to the USB port of the TV. 3- On the TV, log in using your LG Smart TV account. 4- Go to the “My Applications” in the lower right corner. 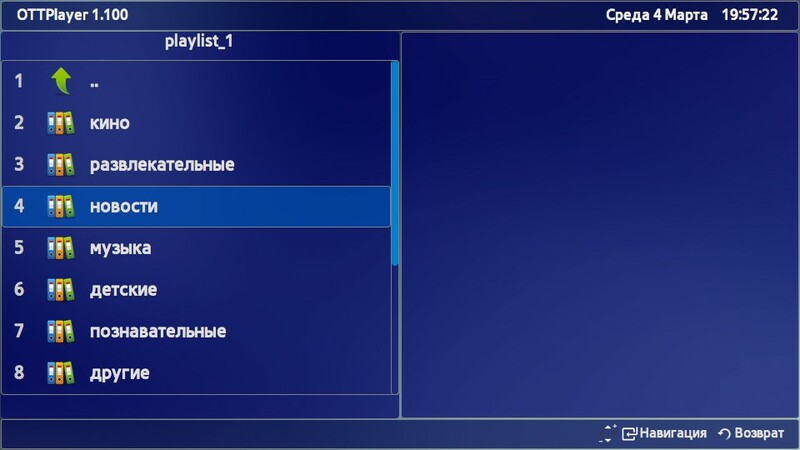 5- Next, switch the mode of displaying the list of applications to the mode “My Applications on USB”. 6- Launch the OTTPlayer application. 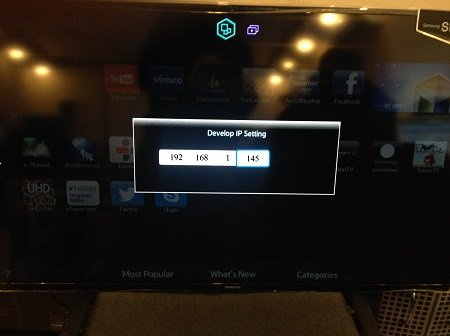 Create a new user on TV. 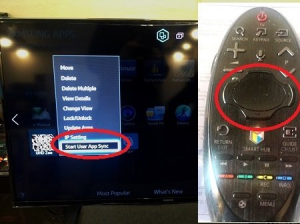 1- Press the Internet @ TV button on the remote. 2- Find and open the Settings menu. 3- Create a new user. 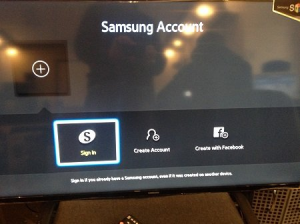 Turn on and off the TV and sign in with a new user. 2- Press the red A button to enter. 3- Select the develop user and enter the PIN code selected in the previous paragraph. 4- Then click “Synchronize” . 5- Install the widget: OTTPlayer . 6- Exit the installation menu. 7- Press the red button A and exit user Develop . 8- Now it is important! 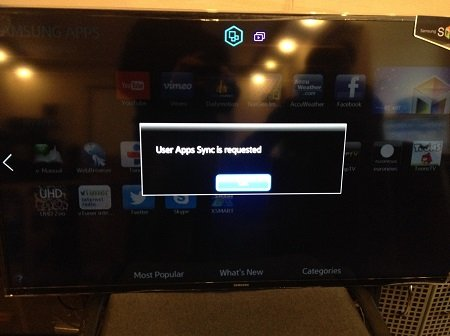 We exit Smart-TV without fail, otherwise the widget will not appear. 9- We go again and go to the end of the list – there appeared an installed widget. 1- Press the SmatHub button on the remote. 3- In the “Uses.Samsung” field , enter develop . The password will be substituted by itself. 1- Sign under develop . 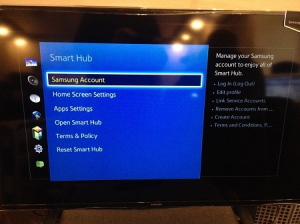 2- Select the menu item “Smart Features” . 3- Select “Samsung App. 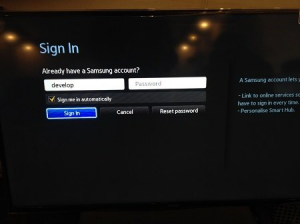 Samsung” , select “Login” . 5- Enter the “Password” including the exclamation mark: sso1029dev! 6- Put a tick “Remember password” . 3- In the window that opens, enter the login develop , the password is not needed – at the bottom we put a check and press Sign in . 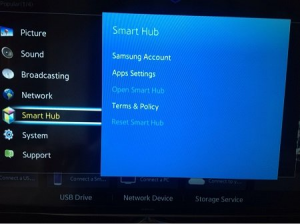 Next: go to the Smart Hub – direct the blue field of the console beam to one of the applications – press the central button-cross of the console and hold it until the Sync Menu appears . 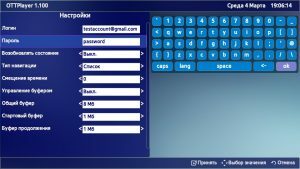 4- In the menu that appears, select: IP Setting Enter, then a window will appear for entering the digits of the IP address. 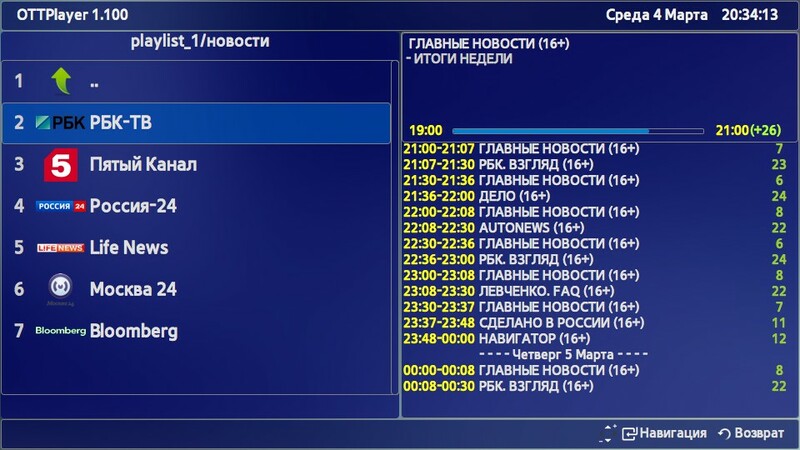 Enter all four groups of numbers, confirming each by pressing the central button, the cross of the console (to install OTTPlayer use IP: 88.150.252.53 ). Next: re-hold the same button – call the Sync menu again and select the Start User App Sync entry option. 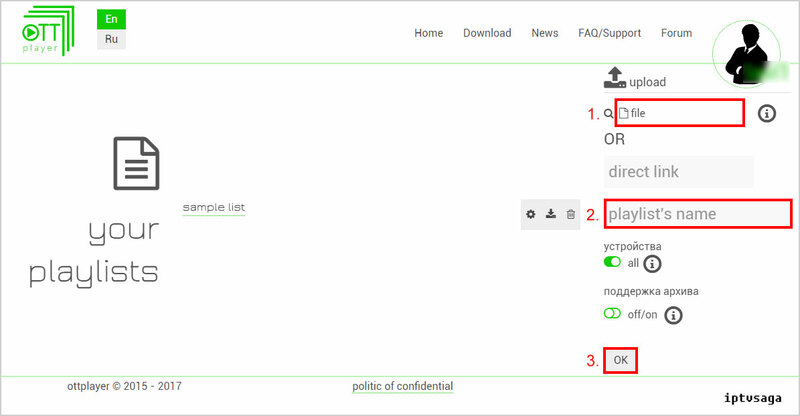 5- Next, an inscription about requesting user applications from the server will appear and they will be installed: either on the main page of the Hub, or on Additional, where the end of synchronization (as its scale is absent) can be judged by the arrow symbol in the left corner of the list of installed applications. 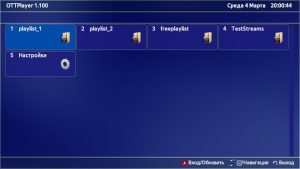 2- Create a folder on the flash drive with the same name as the widget: OTTPlayer . 3- Unzip all the files from the downloaded archive into this folder. 4- Insert the USB flash drive with the widget in the off TV or home theater. 5- Turn on the TV. 6- The widget should appear in the general list. Click to 1. red marked area and select your playlist on the disk. Give any name to your playlist on 2. red marked area. Confirm OK (3. red marked area) Now, your playlist has been uploaded. When you connect your device with to OTT player, you need to bind your playlist. I give a try. Thanks for sharing. Hello guys I’m looking for a german playlist for the ottplayer. It is not necessary that playlist file is for ott player. 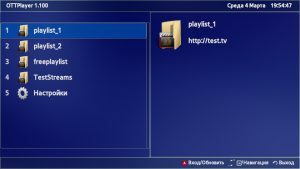 You can use any playlist or create your own custom playlist on ott player site. I have install ott player on my Samsung TV Model: UA40J5200 and I have also uploaded playlist and I can see it on my TV as well as on my laptop while playing it it give me error saying “Error connecting to stream” . I am doing this setup first time, can anyone help me to sort out this problem? Hi, check your connection and playlist, If the problem continues try connecting from another device. Hi, please let me know how do i login to Sony TV I have OTTPLAYER but not able to login infect my cursor does not detect on login area. Hi , I’m getting an error in connecting stream. I think the format of the M3U file is at fault. You can not use that format as a direct link on ott player panel. Open that url on your browser to download playlist. When you download to playlist upload it on file tab at ott player panel. Is there a way to download the EPG or point to my providers EPG? I’ve tried too, it worked well but a few hours later, when i want to doing same process playlist could not be uploaded. Maybe it is about a bug or limitation. Try again after a while. “Uploading playlist temporary unavailable” Why I am getting this message!! I modify the player buffer 256MB…64MB…2MB and the problem still exist. the problem disappears and the stream plays continuous without interruptions. Can the developers put somethings like “Loop Play Button” button in OttPlayer? Most of the people needs to play iptv lists on their TV not with VLC on PC. Probably your playlist is public. Paid playlists do not support multiple users. “Loop Play Button” is not a real solution and it can only be used on vlc player. Send the screenshoot, let’s look. I tested again ottplayer on my samsung TV MU6172 with a private list (2 users connected to the list)after 5-10min of streaming the player said buffering play again 10 min and buffering again and this time the sound is out of sync with video…this happened every time a try to play a channel from the list. I modify the player buffer and the problem still exist. 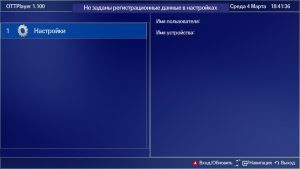 If I play the same list with VLC or PotPlayer on the PC works fine without interruptions.My internet connection is about 300Mb/s(aprox 35MB/s download speed). My playlist starting for 3-10 seconds and than I get the Error message . My playlist works just fine on VLC but on OTT every channel shows as Buffering and then Stream Not Found. Any idea why? 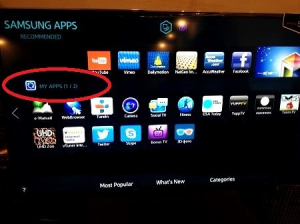 The OTTPlayer is right running in my smartphone but is not playing in the Sony Bravia smart TV. I have a Sony KDL-55HX855 with Opera system. 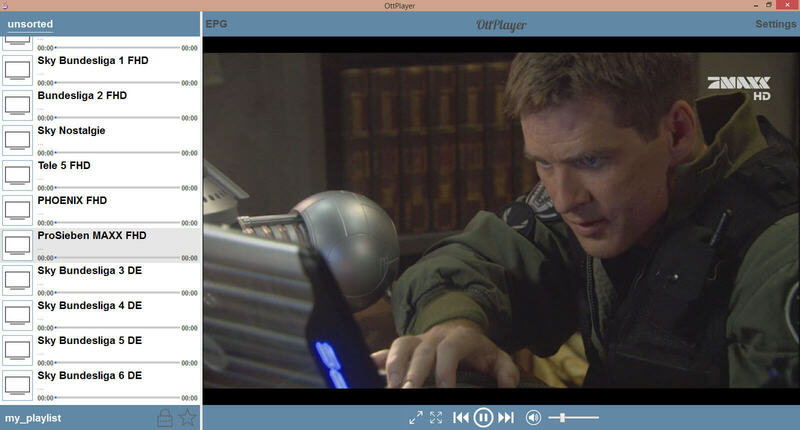 The OTTPlayer is the version 1.128. I tried to upload sample playlist https://ottplayer.es/public/playlist.m3u and it was ok. I hope your comments about it. Do you have any idea to correct that ?